Our quality control covers all facets of customer services, from initial contact, through development and tooling, to production and delivery. All stages of production from receipt of raw materials to final dispatch of goods are fully monitored and recorded. We specialize in the manufacturing and assembly of safe and reliable plastic molds & parts. Through efficiency enhancement, increased productivity, and use of leading edge technology, we strive to exceed our customers' expectations for high quality, low cost, and quick delivery. 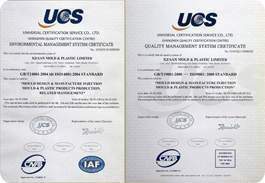 To achieve the above objectives and satisfy the customer's expectations, we are committed to implementing and maintaining a Quality Management System based on ISO 9001: 2000, successful operation of which relies upon the cooperation and involvement of personnel at all levels. Our commitment to quality and continuous improvement will ensure the continued success of our company and the satisfaction of our customers and associates.